The largest Chinese company for e-commerce Alibaba had another strong quarter at the end of 2018. 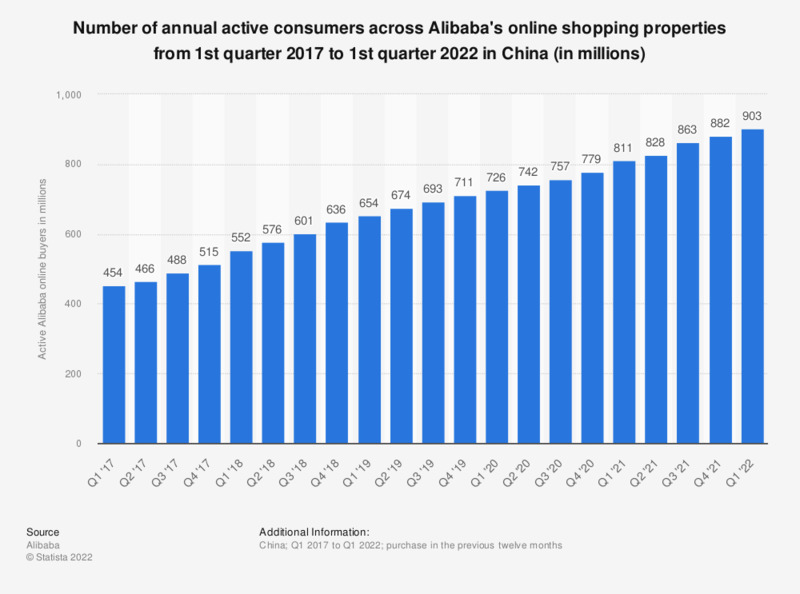 The annual active consumers on its online shopping properties in China reached 636 million, increased from 601 million at the end of September 2018. Founded in 1999, the Alibaba Group grew up to be the leading company providing all kinds of e-commerce services. Besides its most famous marketplaces including Alibaba.com (B2B), Taobao (C2C), and Tmall (B2C), Alibaba also provides leading electronic payment service Alipay, cloud computing services and other related services to meet all needs in e-commerce. Alibaba holds different sale festivals regularly on its online marketplaces to promote sales performance. On its annual 11.11 (Singles’ Day) Global Shopping Festival last year, another record was made in gross merchandise volume (GMV) of Alibaba’s marketplaces. According to the company’s statistics, over 40 percent of Chinese consumers made purchases from international brands on that day. China has the largest number of online shoppers in the world. Due to less developed physical stores and cheap logistic services, e-commerce market is growing rapidly in third-and-lower tier cities in recent years. And as people are getting more aware of international brands, cross-border online shopping is becoming a trend too. With online shopping portals and convenient electronic payment methods, China’s consumers can find products with high quality and competitive price more and more easily.